BEAUTIFULOSOPHY: Could this be beauty magic? Could this be beauty magic? This is currently on my beauty whish lish. Saw it in NY, did not buy it, thought of buying it on Newark airport, until realizing there are almost no beauty neccessities to buy on that airport...but fortunately this is being launched this week in Scandinavia. 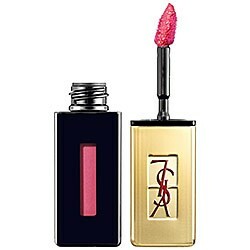 So, this is why I must have YSL Rouge Pur Couture Vernis à Lèvre, urgently; it is said to have the shine of a gloss, the staying power of a stain and the colour density of a lipstick. Could it be any better? The only other lip colour really staying on (they all say they will but never do) is Maxfactor Lipfinity, though it does not really deliver on the glossy part. So I look forward trying this out. Just like the application of Lipfinity, this YSL one should be applied through swiping the colour on, then wait 10 seconds for it to set. And try to resist to rub the lips together. You can buy it at sephora.com, where buyers rated this lip gloss 4,3 out of 5, which is considered doing rather well I would say. And, since were on it, this colour guide tells when to wear what colour. For this spring/summer I love the "Grocery store" and "wedding guest/dinner party". What are you favourite colours? ooooh la la, LOVE that shade. so romantic!!! I love this Poppy King lipstick guide. I had to pin it to my pinterest board for future reference!